Herbs are so easy to grow and use, they should be everywhere in our gardens and backyards, balconies and patios. They can be grown in pots or as hedges, in odd corners and along paths, on fences and in the veggie garden – or, indeed, in a herb garden of their own. The perfect gift. This is a terrific little book from one of OG’s regular contributors. Woodward has written many books on herbs, but this is by far the simplest and most succinct, providing an excellent introduction and easy reference to herb growing, as well as around 40 herb profiles with basic details on how to sow, grow, pick and use them. 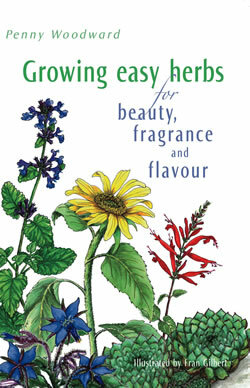 It is beautifully illustrated by Fran Gilbert, and filled with lots of snippets of valuable herb lore. Penny Woodward's latest release, Growing easy herbs for beauty, fragrance and flavour is 152 pages packed with information geared to inspire novice herb gardeners and those who may be intimidated,believing herbs are difficult and time consuming to grow and use. Herbs can be grown decoratively in pots on a balcony in a wheelbarrow, incorporated into the vegetable or ornamental garden, or in their own designer bed. With so many varied applications from culinary to medicinal. Penny has taken a 'sow it, grow it, pick it, use it’ approach to each of the 40 herbs highlighted in the book. fennel, oregano, rosemary and tansy as tough, dry-tolerant and, once established needing no attention - perfect in today’s water-conscious environment. Together with the usual suspects of 'parsley, sage, rosemary and thyme'- Penny has also sought out some of the more unusual and interesting herbs that would make a welcome addition to the garden - why not try balm of gilead, costmary, houseleek, pineapple sage and salad burnet. ‘Did you know?' provides snippets of information and history and to ensure you put your herbs to good use there are instructions for drying and storing herbs. Recipes range from sunflower seed biscuits and peppermint pelargonium chocolate cake to herbal sachets and potpourri - perfect for gift giving, as is this delightful and beautifully presented book. Did you know that if you chew on lemon balm it can ease toothache? Or that fennel is one of the most tough, dry-tolerant herbs, which, once established, needs no attention. Or that the unusual but useful herb, balm of gilead, is ideal in potpourri and attracts butterflies to a garden. Growing Easy Herbs is full of such priceless gems. While the 150-page book includes facts such as these, it is primarily a book designed for anyone who has never tried to grow herbs before, or has tried and failed. Gardening writer and photographer Penny Woodward, who has written seven books about plants, says the aim of the book is to show planting herbs is easy, quick, beautiful and fun. "It is not a comprehensive book, but it is supposed to entice the novice into herb gardening and into using them in the home," she writes. Illustrated with pretty drawings of the herbs by Fran Gilbert, the book is an A to V guide, starting at alpine strawberry and ending with violets. Each herb is accompanied by basic instructions on how to sow, grow, pick and use the plant. The book also includes chapters on garden designs, growing new herbs and positioning for optimum growth. Woodward scatters recycling tips throughout - there is even a picture of an old toaster used as a pot plant. It is a charming book, equally enjoyable to peruse or as a practical guide. Who knew that plants so aesthetically pleasing and so divine in taste and smell can be so ridiculously easy to grow? Growing Easy Herbs for Beauty, Fragrance and Flavour has instilled in me the utmost confidence to go beyond our usual Scarborough fare of parsley, sage, rosemary and thyme, and a few others. It has some lovely, quaint herb garden designs. My favourite is the chequerboard, where herbs are planted in small square plots among pavers in a chequerboard pattern. This allows you to access the herbs easily by stepping on the pavers and it helps contain each herb in a small space. There's also excellent advice on growing herbs from seeds and cuttings, propagating old herbs, when to pick herbs, how to dry them and store them. And Gilbert's illustrations add something quite special. Author and herb expert Penny Woodward says about her latest book: “It’s very much for someone who has never tried to grow herbs before. I wanted to show that they are easy to grow and use, environmentally friendly and can be fitted into the garden in simple and attractive ways. It’s not a comprehensive book but designed to entice the novice.” Of the many herbs available, Penny’s own favourites are lemon balm, marigold, parsley, sage and tree onions.